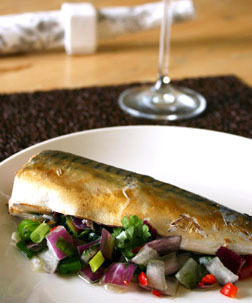 Our most popular recipe: Mackerel like you've never had it before! Chop the garlic, red onion, spring onion, place in a pestle and mortar and mash into a semi-paste. Place into a container. Add the coriander and chilli to the container, stir to combine, then place inside each mackerel cavity. Place back into the container with lime juice and soy, leave to marinade in the fridge for 30 minutes. Place mackerel, juices and herbs into an open Qbag™, then seal with two 2cm folds, pressing firmly. In the Oven: Pre-heat oven to 180ºC/350ºF and cook for 15-20 mins. On the BBQ: Pre-heat BBQ. Cook for 12-15 mins.